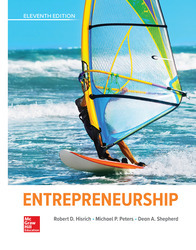 Entrepreneurship, by Robert Hisrich, Michael Peters and Dean Shepherd has been designed to clearly instruct students on the process of formulating, planning, and implementing a new venture. Students are exposed to detailed descriptions of ‘how to’ embark on a new venture in a logical manner. Comprehensive cases at the end of the text have been hand-picked by the authors to go hand-in-hand with chapter concepts, helping to reinforce key topics. CASE 1 TURNER TEST PREP CO.
CASE 12 NATURE BROS LTD.